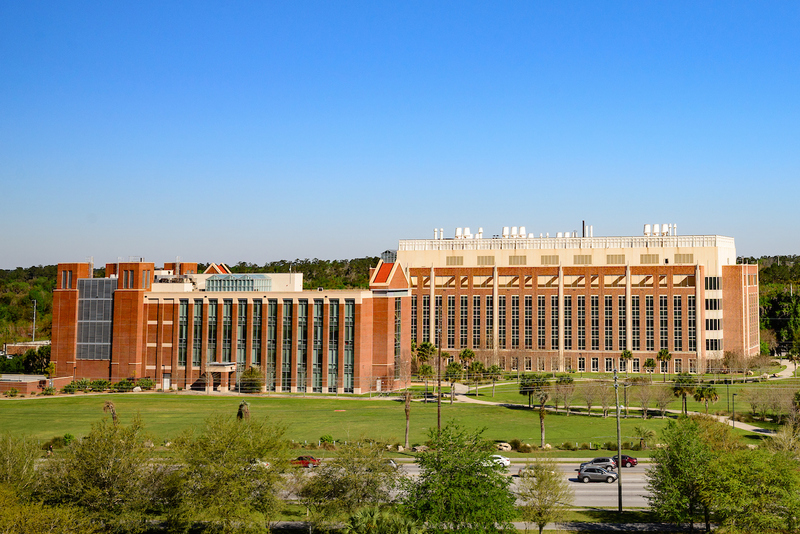 The University of Florida Health Science Center — the most comprehensive academic health center in the Southeast — is dedicated to high-quality programs of education, research, patient care, and public service. The Health Science Center encompasses the colleges of Dentistry, Medicine, Nursing, Pharmacy, Public Health and Health Professions, and Veterinary Medicine, as well as the Veterinary Medical Teaching Hospital and an academic campus in Jacksonville offering graduate education programs in dentistry, medicine, nursing and pharmacy. The arrival of a massive, state-of-the-art scanner called for some adjustments to the entrance to the Evelyn F. and William L. McKnight Brain Institute of the University of Florida. The $46 million facility, located on the north edge of the UF Health Science Center campus on Newell Drive across from the Evelyn F. and William L. McKnight Brain Institute, includes spaces for collaboration, quiet study and reflection, and hands-on interprofessional and team-based education. The new George T. Harrell, M.D., Medical Education Building is coming together brick by brick, with workers doubling efforts to make progress in light of time off for the holidays. Last December, UF Health began a project to update our Archer Road North Campus Main Street (the corridor between the UF College of Dentistry and UF Health Shands Hospital Atrium). Renovations for this area are now complete.